I had originally dismissed the idea of being able to do the marathon champs this year as there were too many logistical issues to battle through. With Percival Property once again assisting with the costs, Sam and Thomas Vidler helping me with accommodation and Ed Mcdonald offering a car share, my final arrangements were all sorted Friday before a Saturday flight! My race prep wasn't ideal in the lead up week. 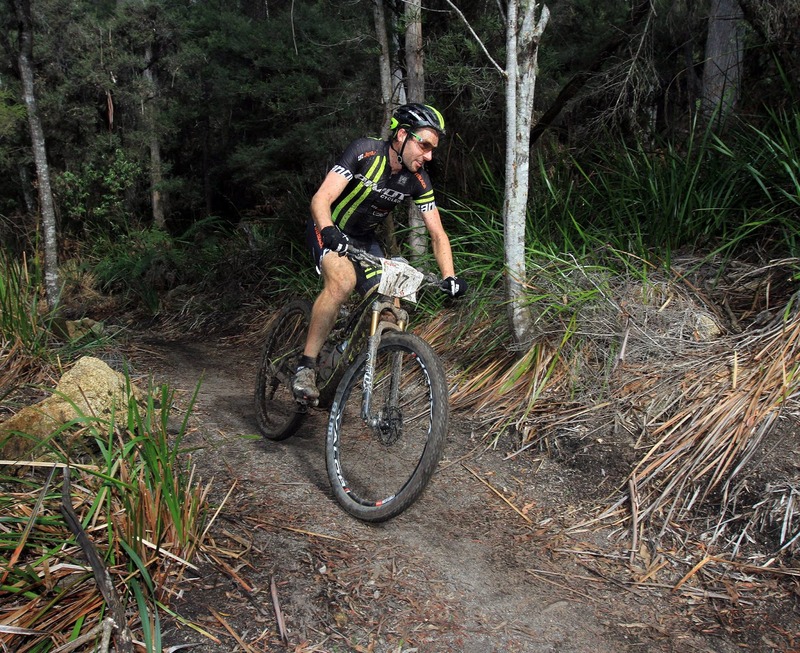 Along with most of the other riders from the Otway 300 I managed to get the sniffles mid week and by Thursday and Friday I was struggling to crawl into work. I wasn't sure how I would pull up in time for the race but flights were booked and logistics sorted. The trails at Derby in Tasmania are my favourites. I have ridden in quite a few places around the globe, but I rate them as the best. They are just well designed and, even in fairly wet conditions, hold up quite well. The downhill sections feel endless at times and I enjoy the multiple line options where it is worth checking out the fastest option. Even feeling crook, I was keen to have some fun on the trails and to also check out some properties for sale! After a lift to Sydney, a night in Dan Baker's room and a Uber to the airport I was on the way to Launceston. Here I met Ed and we made it to Derby in time for a bike build (at the mtb friendly Cascade Cottage) and a sweep lap. After this lap I actually returned back to the event village clean. This was a contrast to the athletes who raced early in the day during rainy conditions who were challenged just to stay upright in slippery conditions. This is true indication of well designed trails. Having trails that can be ridden after a few hours of the rain stopping is quite an important element when designing trails in Tasmania and a reflection of the quality work Glen Jacobs and his team produce. After a little rain during the night and patches of drizzle before the race start I was starting to question how challenging the downhill sections of this race would be. I was more concerned with the ability of my lungs to function as I completed a light warm up and mocked Ed for playing with his rear through axle as the race was about to start. As the whistle sounded the pace from the start felt manageable. As the 18km climb progressed my ventilation increased to a rate that was not proportional to my heart rate. My heart rate during the first climb was sitting in a comfortable 170-175bpm however, I couldn't puff any harder! I decided to take a conservative approach to the climb as I raced for the last position. Around the 8km mark I started to get a little deja vu as my gears stopped tracking correctly. I immediately started to fear a freehub coming loose however, I found it amusing that it was my rear through axle coming loose! Half way up the first climb I managed to move into top 20 and by the top I managed to sneak into the downhill single track within the top 15. As I didn't have very grippy tyres on the front and feeling like I was holding up a local gun rider I conceded a couple of positions down the hill as I tried to stay upright and took a safe approach to the race. Around 1km from the start/finish I managed to wrap my chain and spent the best part of a minute trying to re-route the chain on a path that it should be on. Heading up the climb for the second lap the course follows single track for the first 5km. By the end of this section I had managed to catch back a couple more riders that had snuck away while I was playing mechanics. By the top of the climb this time I was sitting around 12-13th. 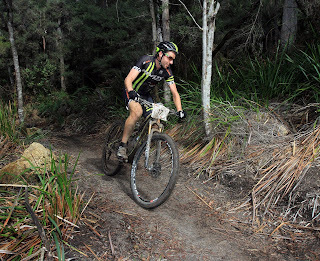 I challenged myself to ride a little harder downhill this time and at times had to make a deliberate decision to hold back to ensure I stayed on the bike. The downhill was great fun. There were section of track that clogged up wheels front and back which meant the following few corners got very interesting. There were sections that were wet and rooty and if you weren't thinking right, would throw a rider off the track. But there were also sections of the same downhill that were loose, sandy and couldn't be hit too hard. Overall a wide range of trails which made things a whole lot of fun. I recall wishing I could ride these trails more as with practice the downhill run would be a great time saver. Heading out on my last lap I was sitting in 11th and I was pretty keen for a top 10. I started to feel really good and just aimed to try and negative split my last lap as I became more familiar with the single tracks and felt a lot more comfortable with my bike. By the top of the climb I had gone past 3 riders which I managed to hold off to the end to sneak an 8th position. I was pretty stoked to hit top ten without being 100% and actually felt I could have raced just as hard for a few more laps! I have heaps of people to thank for helping my weekend come together. Firstly Jen for once again staying at home to look after the kids, Justin for the lift to Sydney, Dan for giving me your room for Friday night, Ed for car sharing, Sam and Tom Vidler for a place to stay, Geoff and Dan for passing bottles, Percival Property for helping out with flights and JetBlack and Shimano Australia for keeping my Pivot running like new.